In response to popular demand, ISOtunes has created the PRO Industrial IT-08, the Listen-Only hearing protection earbuds factories have been requesting. With the best of the features of the extremely popular ISOtunes Xtra, but without the microphone for calling, the IT-08 is a streamlined hearing protection/wireless music-listening device tailored to suit the needs of industrial workers. 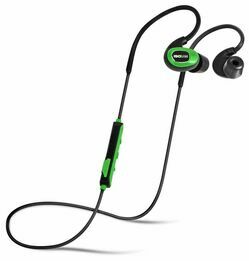 Also called the ISOtunes PRO in Safety Green, these listen-only earbuds are ideal for workplaces in which communication must be restricted, but workers still want to enjoy their music. ISOtunes are tested and approved in accordance with ANSI, OSHA and CSA standards. The IT-08 features ISOtunes' SafeMax™ Technology, which keeps the internal volume below a safe threshold (79dB). The IT-08 complies with all OSHA and NIOSH requirements, ensuring that workers cannot damage their hearing with extremely loud music. Most of the ISOtunes line is VL to 85dB, but this IT-08 PRO Industrial model has a strict 79dB volume limit. 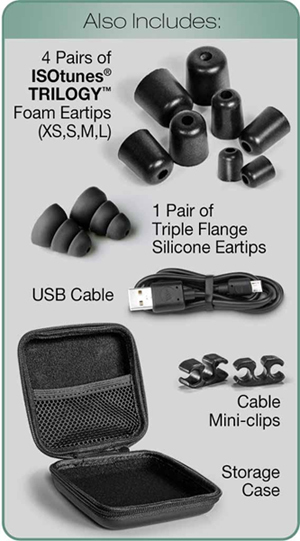 ISOtunes TRILOGY™ foam ear tips do double duty, providing good NRR 27 noise blocking while also ensuring a secure fit. Not only does this protect the wearer's hearing, but it also improves the quality of the sound that reaches your eardrums, delivering a richer listening experience. And the TRIOLGY™ foam is soft and smooth, for a reliable fit that won't hurt or fall out. These listen-only noise-isolating earbuds allow the wearer to listen to music while still protecting their hearing, using Bluetooth to connect to a sound source. Workers can enjoy their music, podcasts, sports, and more, helping to keep workplace morale high - with no microphones to violate the rules in restricted communication environments. The sound quality is good, too. Bluetooth 4.1 + EDR ensures music signals stream responsively, delivering satisfying high definition aptX® audio. Intuitive in-line buttons allow for quick volume adjustments and play/pause/skip toggling, so workers can easily control their music without breaking stride. Weighing in at just 16g/0.75oz, the ISOtunes PRO Industrial's wireless design is effortless to wear, and it never gets in the way or interferes with movement. The earpieces are connected to each other to make them harder to lose, which also gives the wearer a handy way to hang these earbuds around their neck/shoulders between uses. No wires dangle down into the user's activity area, so there is nothing to get tangled up or snagged on machinery. The ISOtunes PRO Industrial IT-08 includes a custom-fit memory wire that hooks around the ear and conforms to the side of the head, holding the earpieces in. With the flexible wire at work allowing the wearer to adjust the earbuds and get a customized fit, the IT-08 are very comfortable and stable. Another feature that sets the PRO Industrial apart is ISOtunes' PRO-tier battery life. With a 10 hour music playback time and 240+ hours of time on standby, the IT-08 can keep up with all-day use. And the ISOtunes PRO Industrial is IPX55 dust/sweat/water resistant, so it's tough enough to stand up to long hours of wear in challenging industrial settings. The hi-viz Safety Green color helps with compliance. Both of these PRO Industrial models are designed for OSHA-controlled work environments. The ISOtunes PRO Industrial IT-08 is listen-only, it does not have a microphone, and it has its internal volume limited to 79dB. The ISOtunes PRO Industrial IT-09 does have a microphone for calling/talking, and it also has its internal volume limited to 79dB. Alternatively, the non-industrial ISOtunes PRO has a microphone, and it limits volume to a more generous 85dB, if you're looking for calling and don't need such strict volume limiting. Whether you need a functional smartphone headset or a listen-only solution, an ISOtunes PRO model is available to suit your needs.